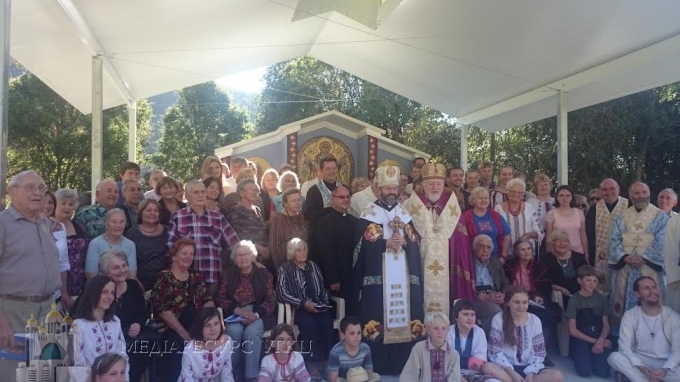 The Father and the Head of the Ukrainian Greek-Catholic Church, His Beatitude Svitaoslav (Shevchuk) today, on September 29th, blessed the UGCC Chapel of the Intercession of the Most Holy Mother of God in the so-called Marian Valley, located close to the city of Brisbane. The Marian Valley was established for veneration of the Immaculate Virgin Mary. Here various confessions, religious communities of different nationalities have their chapels of the Immaculate Virgin Mary, to which pilgrimages are held. The Chapel of our Church in the Marian Valley was established by the parishioners of the Church of the Intercession of the Most Holy Mother of God in the city of Brisbane. “This really is a great blessing and we are thankful to the Lord God,” said the Prelate to the faithful, ”and we should express our gratitude today for the fact that the first meeting that I have with your parish is here. In the Gospel, we heard how Mary met Elizabeth. And we heard about the secret kiss that the Virgin Mary gave her... While praying here, we felt the presence of the Holy Spirit, we felt the spirit of unity, the spirit of happiness, the spirit of peace. The Most Holy Immaculate Virgin kissed us with her secret kiss. His Beatitude Sviatoslav reminded those present that it was precisely on the day of the Feast of the Intercession of the Most Holy Mother of God, that the Ukrainian Insurgent Army was formed. “The Virgin Mary today covers our Ukrainian army which is fighting and safeguarding the freedom and independence of our nation, our men who every day are sacrificing their lives for our native land,” stated the preacher. “May the Virgin Mary hold under her Intercessiopn each one of us. May here there be answered all the prayers which you will bring to her. May She take care of all of us, for there is no more powerful intercession, no more powerful intermediary, protectoress than she. May the Most Holy Immaculate Virgin cover all of us with her holy mantle,” wished UGCC Head.